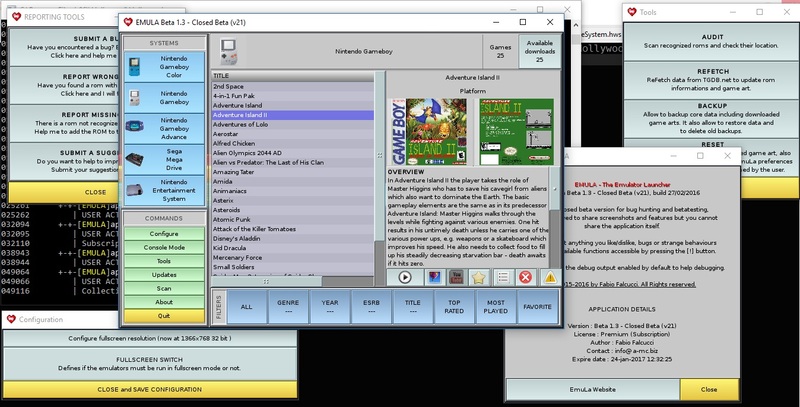 Recently I’ve added 2917 Genesis/Mega Drive roms and the Windows build is able to launch these roms, I’ve to add support for AROS and after that I will focus on porting EmuLa on the mighty Raspberry Pi along with Linux PPC and Linux x386! There are lots of plans for this project, one of the core feature still missing is a global configuration for the keyboard and the joystick/joypad, once it will be implemented the player will have the ability to configure its input device only once and EmuLa will take care of the installed emulator’s configuration files. This concept have been already applied to the fullscreen options. Another thing I’d like to add is the hiscore submissions to build worldwide charts. Stay tuned and share this post if you like the project! Feel free to ask details or suggestions! Next Post Next post: July update : EmuLa is coming!